The astronomer lives in Australia. To see Australia on Earth, look for the pinkish continent. Orion was a hunter in ancient Greek myths. Click and drag the video to move around. Shooting stars are also called meteors. This is called coral spawning. How do astronauts sleep on the International Space Station? Experience a night of karaoke - with the Muppets! What do you hear at night? Pictures made by joining up stars are called constellations. At night when you are fast asleep, another world awakens... 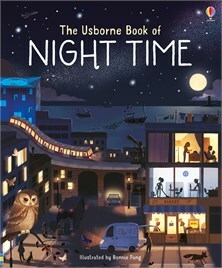 Explore the world of night in this gorgeous picture book and discover nocturnal animals in the countryside, cities that never sleep and the secrets of the night sky. With lots to look at and talk about on every page and links to specially selected websites with more to discover.